If you were feeling good after beating the Cleveland Browns a week ago, then Sunday’s gut-punch loss probably felt more depressing than usual. After securing their first win of the 2018 NFL season, the Oakland Raiders put together their most pathetic performance to date in a 26-10 beatdown at the hands of the Los Angeles Chargers. Heading into the game, I felt like Sunday would be the barometer for the 2018 Raiders — if they could travel on the ‘road’ (if you can call Los Angeles that) and beat a decent Chargers team, it meant good things moving forward — like, say, seven to nine wins this season. On the other hand, if the Raiders couldn’t get this win, it meant the team was further behind schedule than anyone hoped and a win total in the range of five as more likely. And, well, then Sunday happened. Not good. Normally in this space, I pick a few things that stood out to me from Sunday, but this week I want to dive deep into the offensive line play — which I thought was the key (not in a good way) to Sunday’s game. Entering the game, the Raiders were without their starting right tackle (Donald Penn) and left guard (Kelechi Osemele) — guys who were being replaced by a rookie making his first start and a fourth-year man making his fifth career start — all this on top of starting a rookie left tackle. Looking at those numbers (and even more so in watching the game), it seemed as if the Raiders knew they needed to run the ball early and often — only it didn’t work. And when they did pass, the emphasis was clear: get the ball out quickly. The problem was when halftime rolled around, the Raiders were already down two touchdowns. 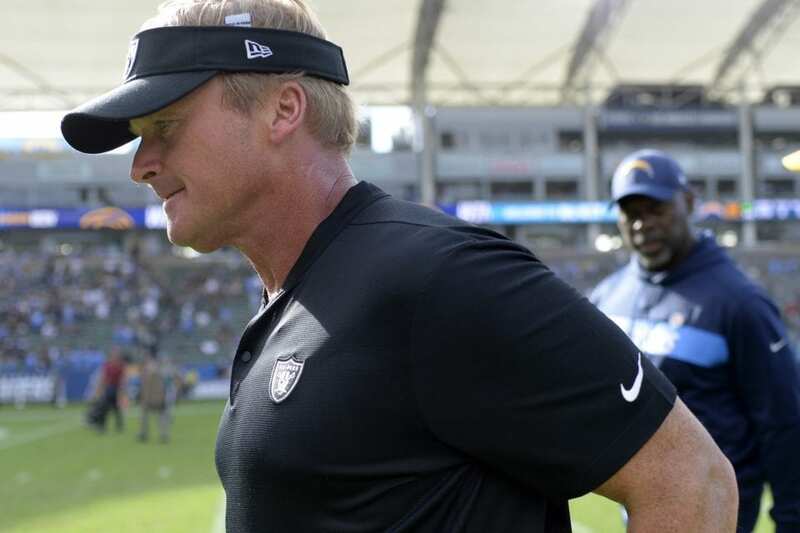 By the time the final whistle blew, the Chargers had racked up three sacks (all against Miller, who Gruden announced after was playing with a Grade II sprain of his MCL) and held the Raiders to just 41 rushing yards on 13 attempts (3.2 YPC). The Chargers also finished with 6.5 tackles for loss. The way the Raiders started the game, it was as if they were prepared to play a defensive slugfest. Unfortunately, their defense isn’t nearly good enough to keep up — especially against an offense as prolific and explosive as the Chargers. Once that became clear (early in the second quarter), it was as if the Raiders knew they were screwed — they couldn’t get the protection they needed to air it out and yet, they desperately needed to if they were going to have any chance of coming back. As the season moves forward with the Raiders now at 1-4, the next four weeks present a fascinating test for this group. Next week they play the Seattle Seahawks (2-3) in London and then after a bye week they host the Indianapolis Colts (1-4) and travel to play against the San Francisco 49ers (1-4). Heading into the Chargers game, the thought was that they could emerge from this stretch with a shot at .500 halfway through the season — but after Sunday’s performance (and with question marks all over the offensive line), even a schedule as easy as this one doesn’t seem like it guarantees anything. Buckle up Raider fans, if Sunday was any indication, we might be in for a loooooong season.